If you’re like most parents, you’ve developed a repertoire of recipes that have become family favorites and they stay in heavy rotation: After all, it costs time and money to try new recipes that you’re not even sure they’ll like! But truth be told, the same old-same old has become boring to you. You’d love to try some dishes you haven’t made before. When will you find the time to come up with new ideas though? And you’re pretty much on auto-pilot when you go to the grocery store with your current (read: boring) shopping list, so how can you make meal planning and grocery shopping more efficient? We’ve got some suggestions! 1. 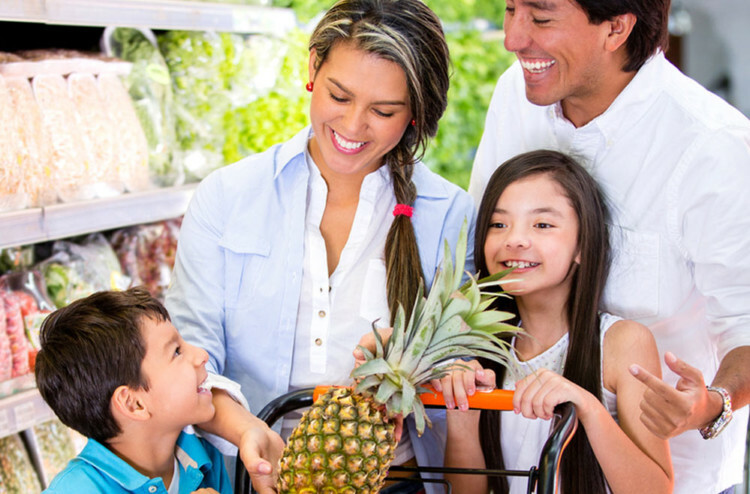 Get kids involved in meal planning. If you don’t want to invest in pricey cookbooks, take a special trip to the library with the kids and have them select five to 10 recipe books. Challenge them to look for books in a few different categories, say breakfast recipes (this new cookbook, Symmetry Breakfast: 100 Recipes for the Loving Cook will be a fun one for kids, and is loaded with avocado recipes! ), school lunches, after-school snacks, and dinner entrees. If you want them to learn more about their cultural heritage, send them on a search for cookbooks from Mexico or Latin America (Maricel Presilla’s Gran Cocina Latina: The Food of Latin America is a fabulous resource with hundreds of recipe ideas). Once you’ve hauled the books home, put the kids to work! Have them make a list of recipes that sound interesting and tasty. Then, give them another literacy and writing task: Making a shopping list! Sharing the responsibility of meal planning can be fun and can also relieve you of the burden of doing everything on your own. The saying is true: When it comes to the kitchen, there really is an app for almost everything! Whether free to fee-based, you can download apps that can do everything except cook your family’s meal and serve it to them. There are apps that serve up recipes that you can filter based on your family members’ dietary needs and preferences; Su Chef, for example, lets you search by special diets (nut-free, gluten-free, and diabetic, to name a few) and by single ingredients (avocados!). How to Cook Everything, an app by popular food writer Mark Bittman, makes good on its promise to teach you how to cook anything. Plus, it has all sorts of built-in lessons (knife skills, for instance) and kitchen tricks (how to peel garlic), as well as a timer and a grocery list customized to each recipe. If you have a hard time coming up with meal ideas and you want one of those apps that handles everything but the cooking, take a look at Spinning Meals. It starts by planning a full week of meals — from breakfast to snacks and dinner — based on your tastes and preferences, and then develops your shopping list, even sorting the list by grocery store section so you can get in and out of the supermarket quickly. 3. Test out delivery services. True — not every budget or every location allows you to try out the convenience of grocery delivery services like AmazonFresh, FreshDirect or Peapod, or a prepackaged meal program like Blue Apron, but if you’re short on time or you really just want someone to put together all the components of a great meal for you, these are options worth testing. The meal box service Chef’d features menus by a number of Latino chefs, including Ana Quincoces, Chris Santos, and Angelo Sosa. Even if you use these as an occasional treat, supplementing your own menu planning and shopping, they can relieve you of some of the time and effort that making daily meals requires. 4. Hold a prep party! Have you ever heard the American sayings “Many hands make light work” and “Time flies when you’re having fun”? They’re true! Schedule a couple hours each weekend to plan and prep meals for the week ahead. Give everyone a job based on their age and ability. While you might not want to put younger kids on knife work, for example, they can root around the fridge and find the ingredients you’re going to prep, help with measuring, and pack cut ingredients into containers for the week ahead. Put on some fun music, hand everyone an apron, and get to work!